Picture yourself enjoying an evening fireside, looking out upon the ocean. The moon is high in the sky and you can hear the waves crashing. You reflect on the day you’ve spent playing in the ocean, relaxing in the water-fall spa, and cooling off in the pool. Perhaps you’ve treated yourself to a well-needed spa treatment and dined at the exquisite oceanfront Sinclair’s Ocean Grill. Today has been spectacular, and you know the next day will be as well. 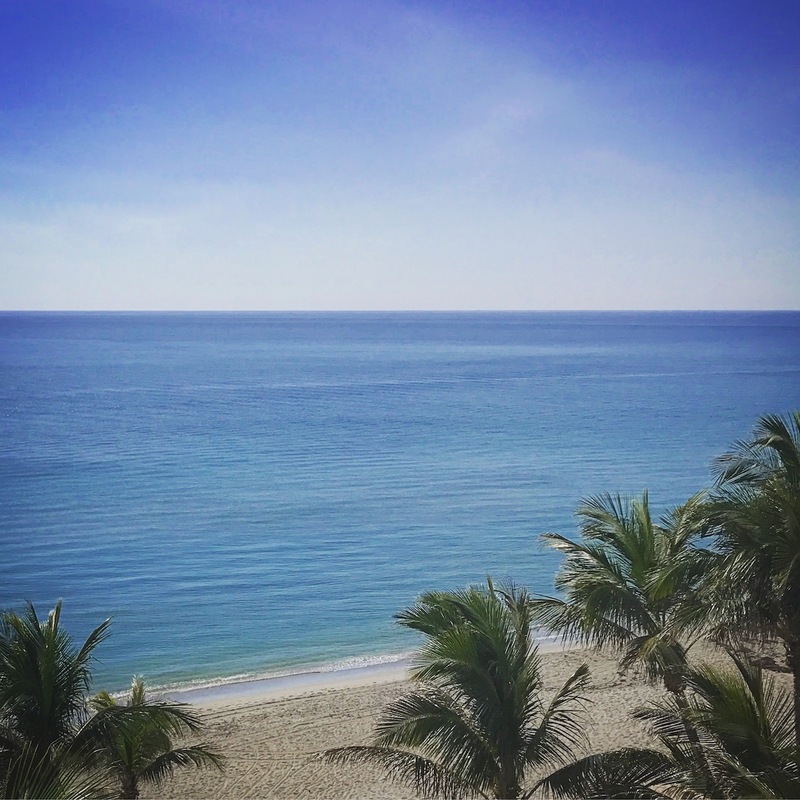 Of course it will – you’re at Jupiter Jupiter Beach Resort & Spa, an exclusive and elegant oceanfront retreat. 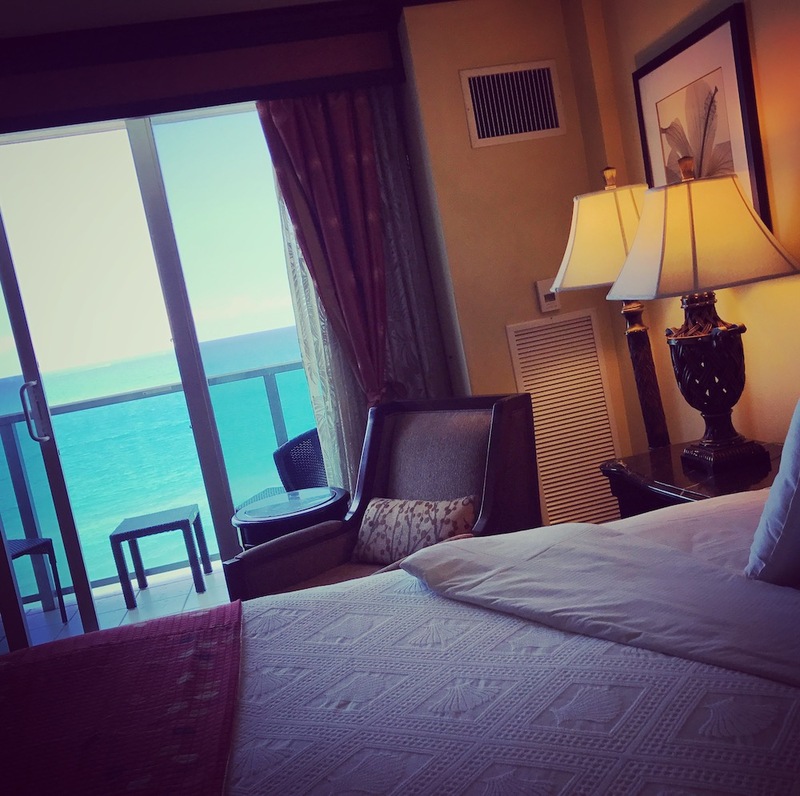 The room, both elegant and stunning, provided an incredible view of the ocean. The designer mahogany furnishings brought an island-inspired style to the room, and the overall tropical ambiance was splendid and relaxing. The luxurious Egyptian Cotton linens will give you the softest sleep and sweetest dreams. Rooms are spectacular in style and boast gorgeous marble bathrooms with all the modern amenities one could ask for. We all need time for rest and relaxation, and this beautiful resort encourages such bliss. In today’s busy world, it is important to cultivate a healthy mindset. 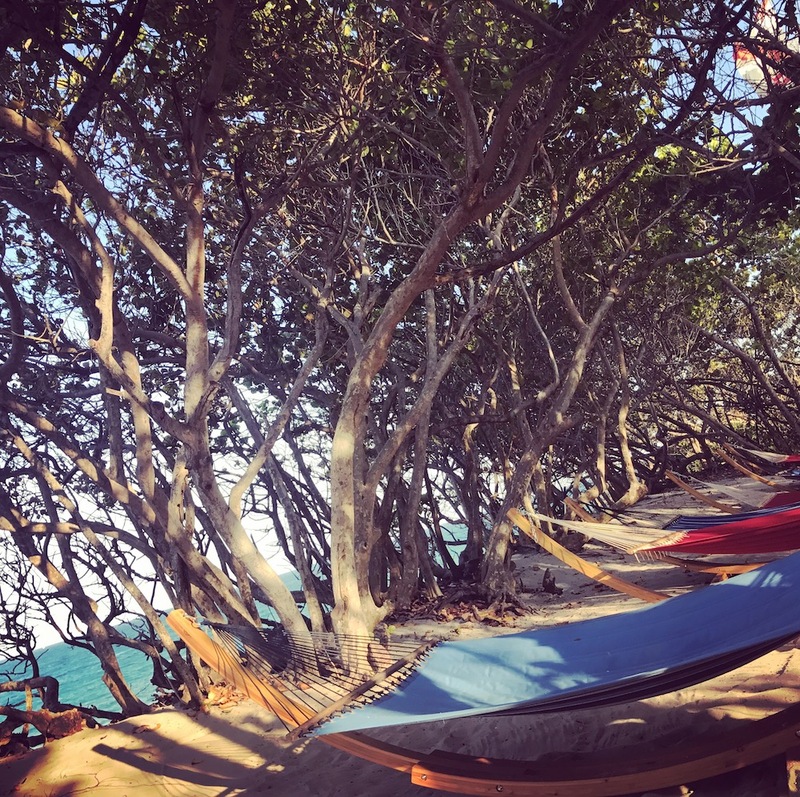 A healthy mind needs a healthy body, and the signature treatments at Jupiter Beach’s OPAL Spa are designed to do just that – by pampering your body. Let the cares of the outside world disappear as you enjoy the multiple signature treatments that Jupiter has offer. Rest at ease knowing that the products used at the Spa are all-natural and paraben-free from Aromatherapy Associates, Pure Fiji, and B. Kamins. Some of the Spa Treatments include the OPAL Signature Body Renewal, OPAL Signature Perfect Massage, OPAL Signature Facial, and the OPAL Signature Manicure and Pedicure. We recommend the OPAL Signature Ritual which will take you blissfully away from the cares of everyday life. The OPAL Signature Ritual combines the OPAL Signature Body Renewal, Facial, Manicure & Pedicure Treatments creating the ultimate spa experience. One of the highlights pre or post-treatment at the Spa is enjoying an organic tea from the Tea Forte Hot Tea Bar or drinking a glass of the Spa’s own signature dark chocolate. The dark chocolate is “kept in constant motion to keep the rich splurge smooth and sweet.” Let this be a notice to chocoholics and non-chocoholics alike – it is simply irresistible! Rise to the occasion each day with a slew of activities at your doorstep. 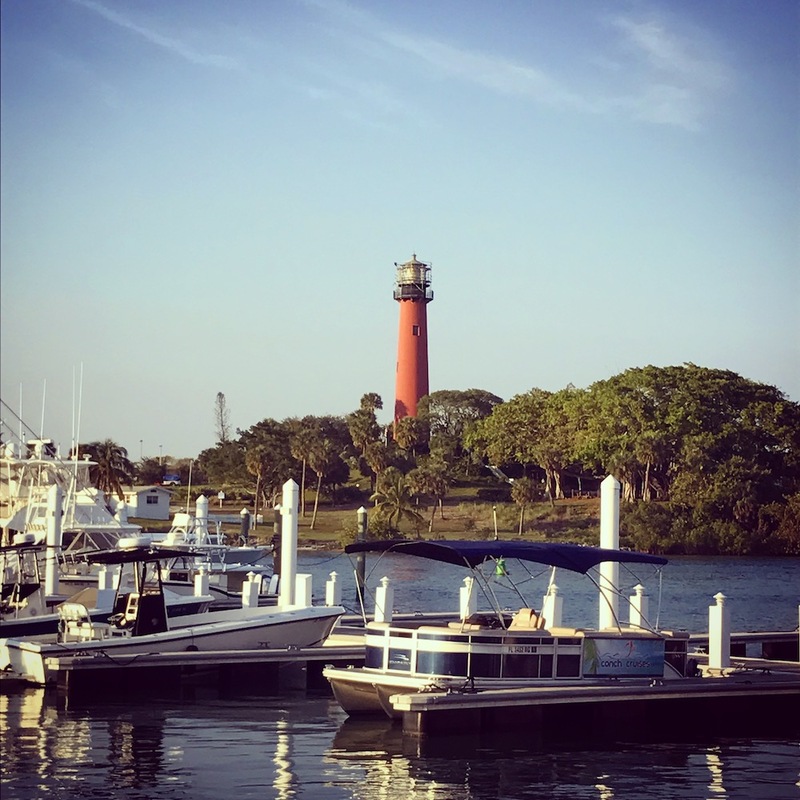 Tennis, golf, snorkeling, fishing, and all the attractions that Jupiter Beach has to offer will entice you. 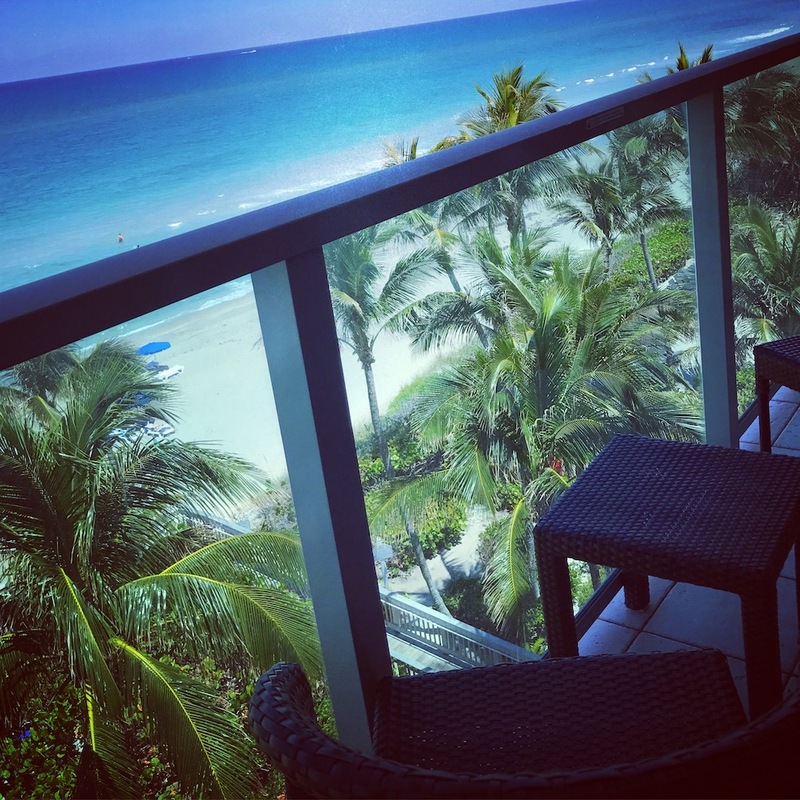 Yet with an oceanfront pool, Jacuzzi, and hammocks – it’s hard to imagine a reason to want to “do” anything besides take it easy. In addition, a new fire pit overlooks the ocean. 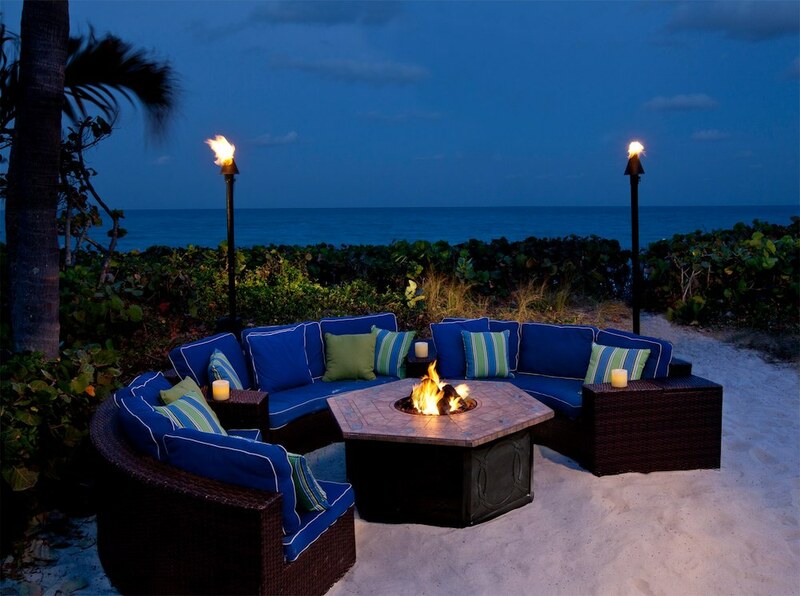 Of course, the fire pit rests on the sand dune, making it – like everything else at Jupiter Beach Resort & Spa – picture-perfect. During our time in Jupiter Beach, we had the chance to visit the Loggerhead Marine-life Center. This wonderful non-profit organization promotes conservation of ocean ecosystems with a special focus on threatened and endangered sea turtles. 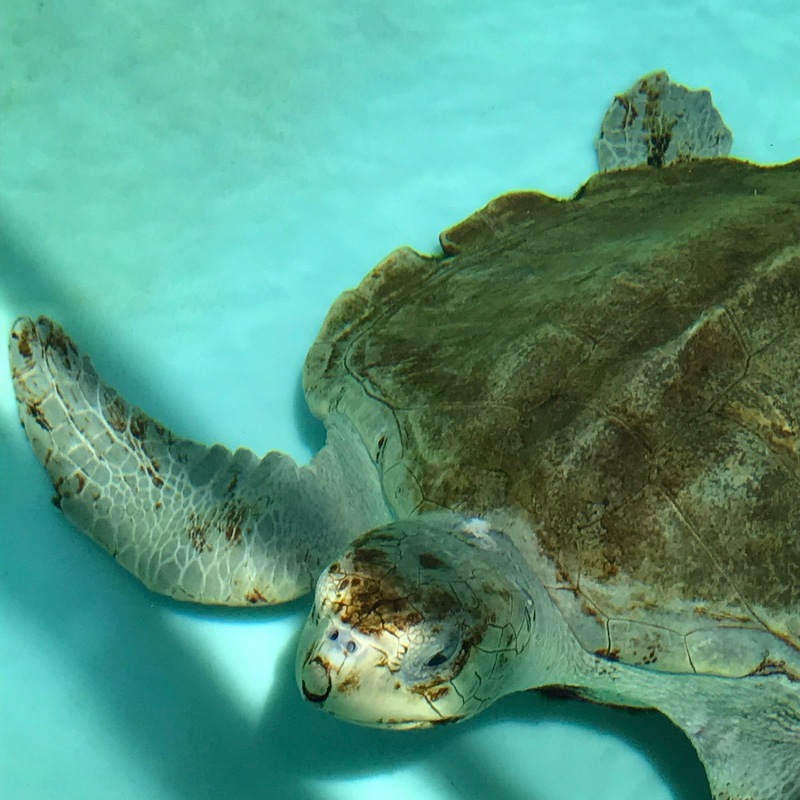 The center has 15 sea turtle viewing tanks, six marine aquariums, an interactive exhibit hall, and a hospital viewing window. It’s a heart-warming and inspirational environment and I would definitely recommend a visit whilst you’re in town. A fantastic and fun way to get around the area is on one of the nifty Scoot Coupe’s which are available to rent from Scoot-n-Around Juno Beach. We had a great time exploring this beautiful beach town, and these little beauties make it a fun and convenient adventure. 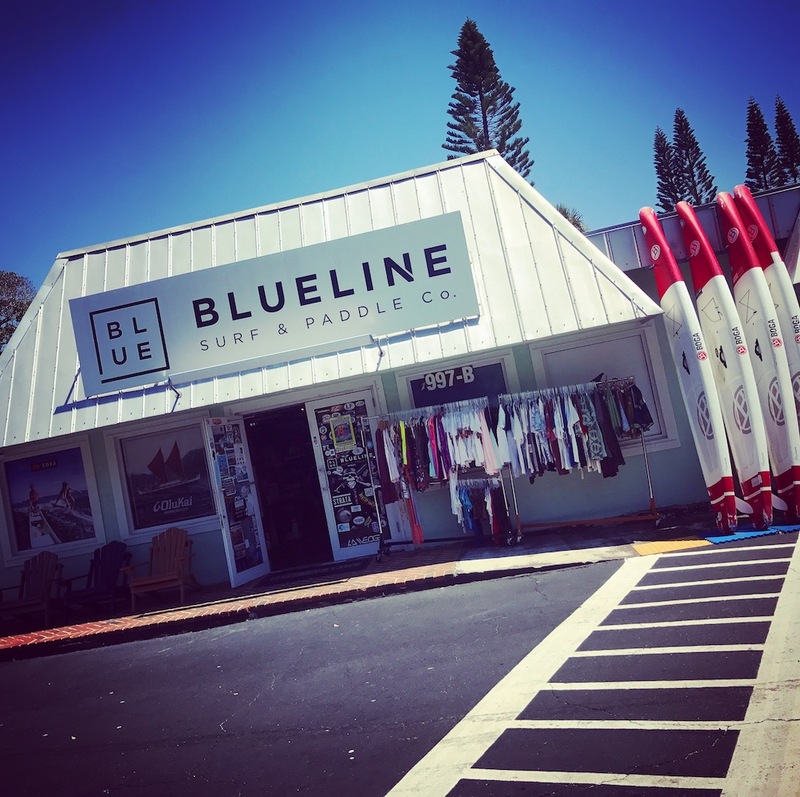 Consider an excursion on the water with Blueline Surf & Paddle Co. 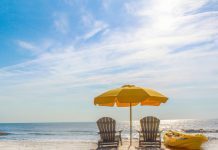 Here you can rent kayaks and paddle boards, or maybe take the scenic Eco-Tour where you can explore the beauty and wildlife of the intracoastal waterways. Lest we forget – Jupiter Beach Resort & Spa is ideal for weddings. 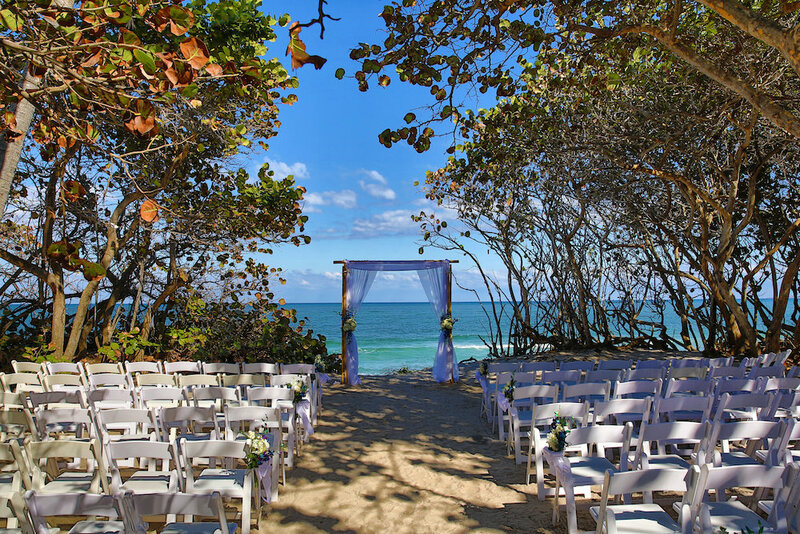 Let the staff at Jupiter Beach help you have your dream wedding. 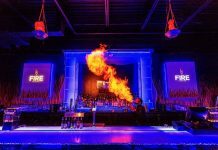 On the other hand, the resort is also great for varying events with two executive boardrooms, a ballroom, a gallery, and more. 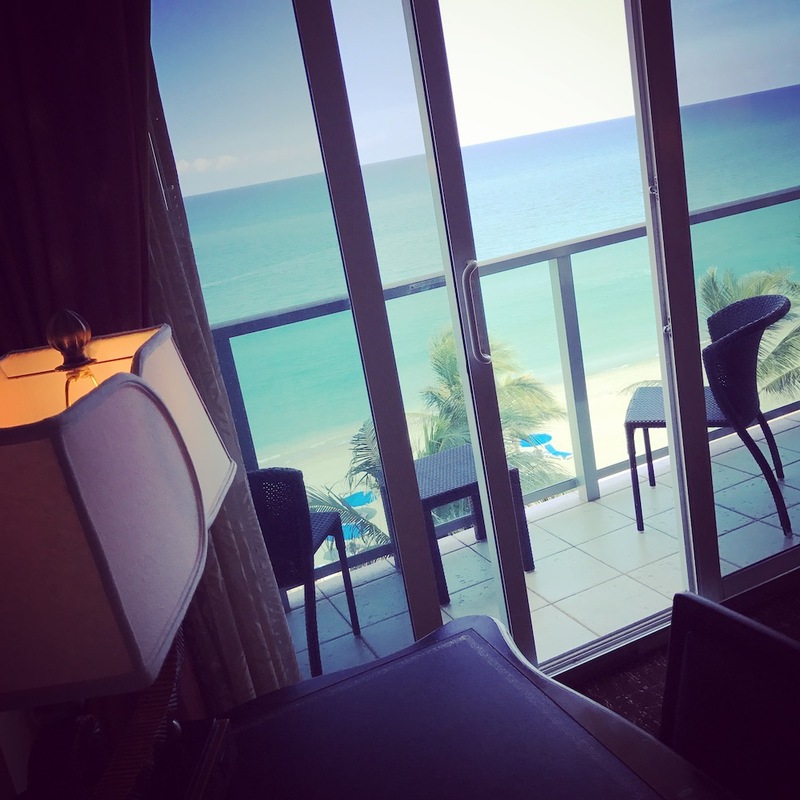 With breathtaking oceanfront scenery, there’s no need to leave this beautiful resort. The Dining at Jupiter Beach is excellent. Dining options at the resort include Sinclair’s Ocean Grill, Sinclair’s Lounge, and the Sandbar. 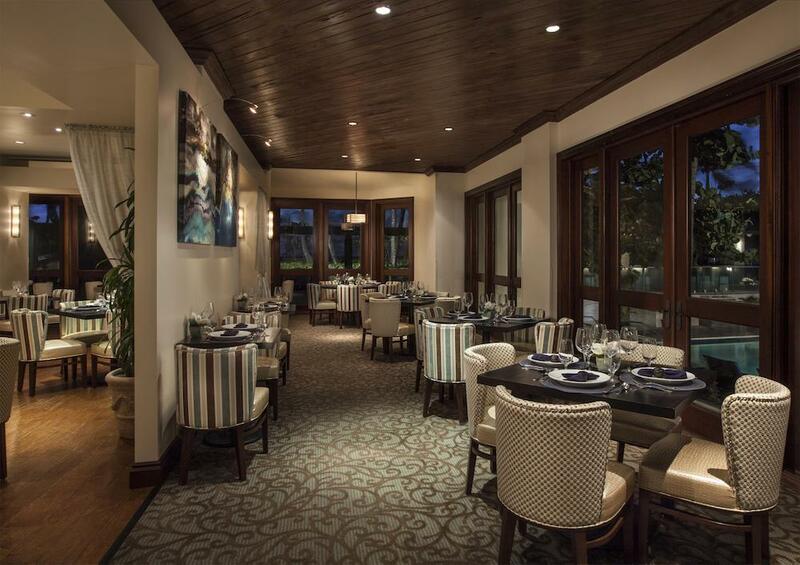 As the only oceanfront restaurant in Jupiter, Sinclair’s Ocean Grill boasts “South-Florida focused fare”. The setting is truly one-of-a-kind, as was our dining experience. To begin our dinner at Sinclair’s Ocean Grill, we started with Tuna Tartare. 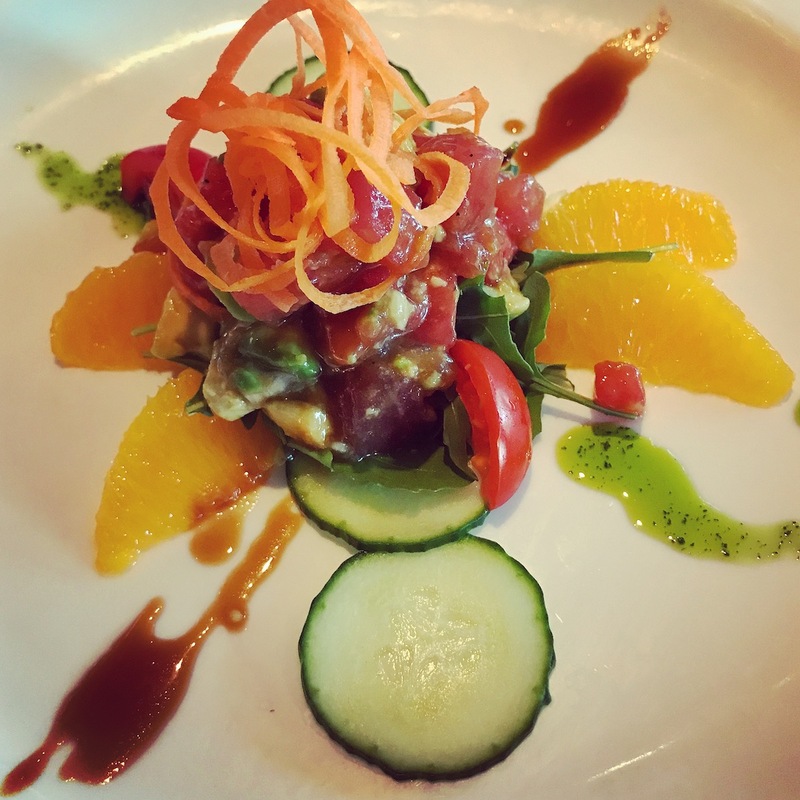 The Tuna Tatare, with Hass Avocado, European Cucumber, Green Onions, Tamari Soy Sauce, and Chili Garlic Sauce, was a delectable and refreshing starter. 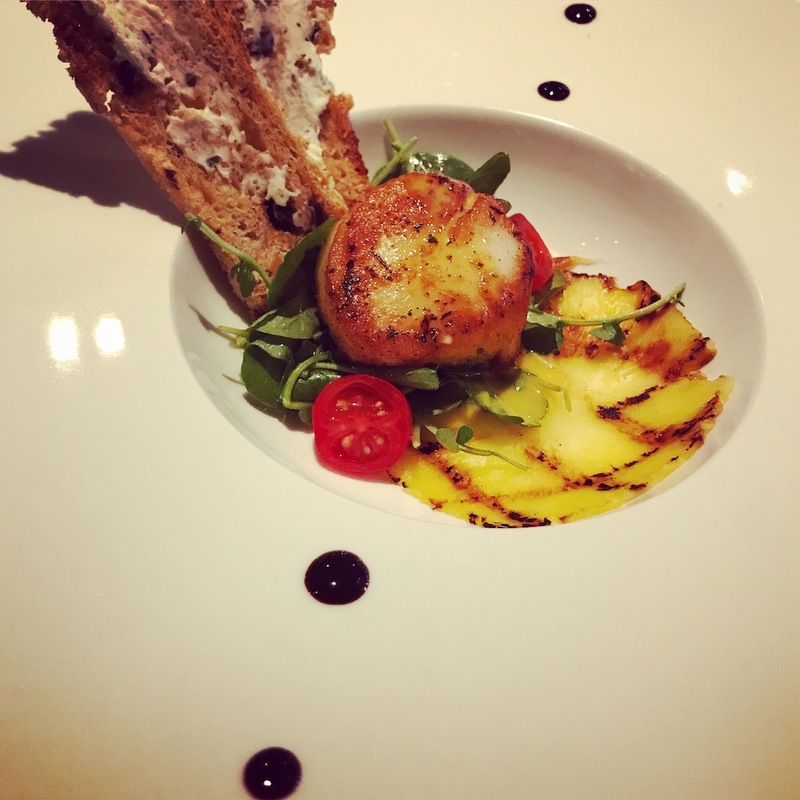 Following the Tuna Tartare was the Seared Diver Scallops, with Iceless Watercress, Grilled Pineapple, Toasted Boursin Crostini, Aged Balsamic Reduction, and Citrus Ginger Sauce. The Seared Diver Scallops were sumptuous and flavorful. As our mouthwatering entrée, we enjoyed the Beef Tenderloin. The Beef Tenderloin was complimented by Thyme Roasted Shitake Mushroom, Parslied Potato Brile, Sweet Potato Curls, and Port Wine Bordelaise. Truffles and Strawberries completed our dining experience. 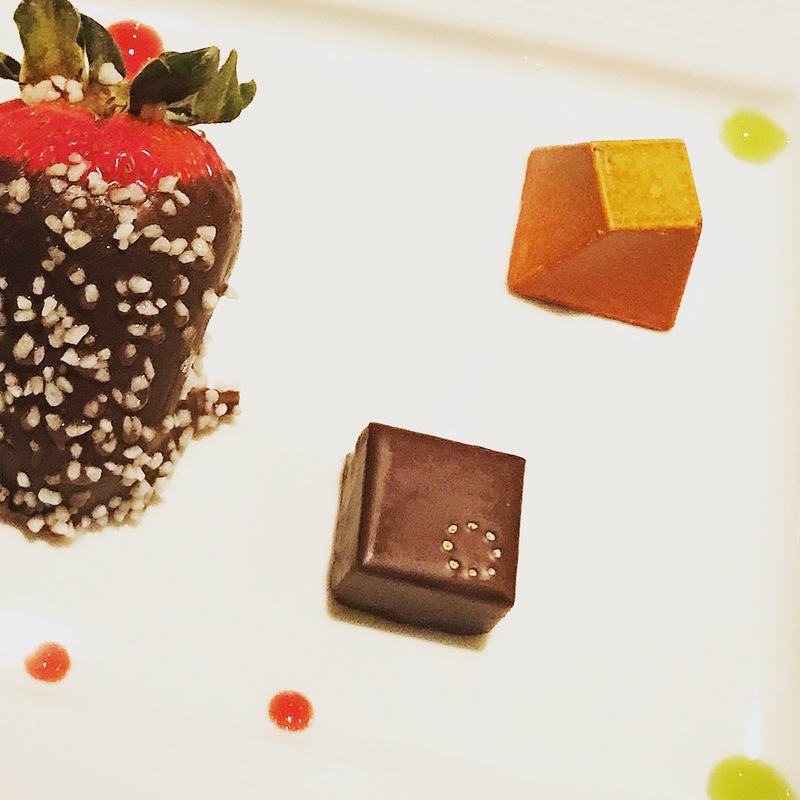 The Strawberries were covered in Decadent Dark Chocolate & Sea Salt for the perfect combination of sweet and savory. Champagne and Hazelnut Chocolate Truffles also topped off an already exquisite meal. 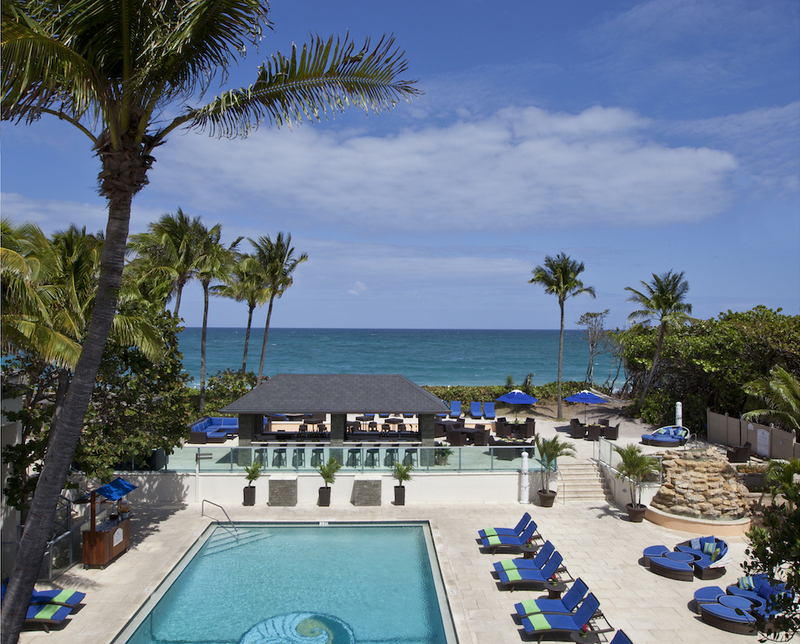 Come to rejuvenate and enjoy life at Jupiter Beach Resort & Spa. Whether you are celebrating an occasion or celebrating life – Jupiter Beach Resort & Spa will whisk you away and keep you mesmerized. Thank you for hosting us.